It’s that time again to get your Second Life dancing shoes on and head on over to Muddy’s Cafe for the 13th Annual Make a wish concert. Check out this one off line up. This is Zoha Islands 11th year in business and with that we would like to donate this celebration to the Make A Wish Foundation with the best of the best. 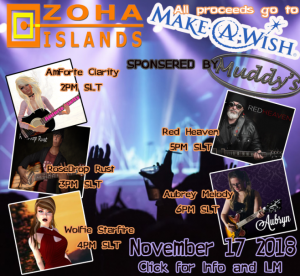 For the past 11 years Zoha Islands has supported Make A Wish with some of the BEST LIVE MUSIC you will ever hear. Taking the stage is the finest lineup after weeks of searching. November 17th 2018 you can see this one off concert! At 4pm SLT WolfStarFire: With her love of music firmly in tow, Wolfie has released her first album which is a heartfelt blend of contemporary pop, country, and blues. Each song on her album is written by herself, making sure that her music and lyrics are moving, inspirational, and thoughtful. This ensures that more than a few of her songs will get stuck in your head while you listen to each of her tracks. Muddys Cafe has been around a long time and is one of the sponsors this year. Donating not only the venue but a newfound support in the effort to help make the residents of Second life through commercial advertising more aware that we can make a difference in a child’s life through Make A Wish. We would like to thank in advance the great Musicians that made time for this years concert and to Muddy’s Cafe/ Muddy Radio and to ALL of the residents that have made this one of the BEST concerts ever to happen in second life for 13 years. ← Windows 10 October 2018 Update still not released, and ran out of October.